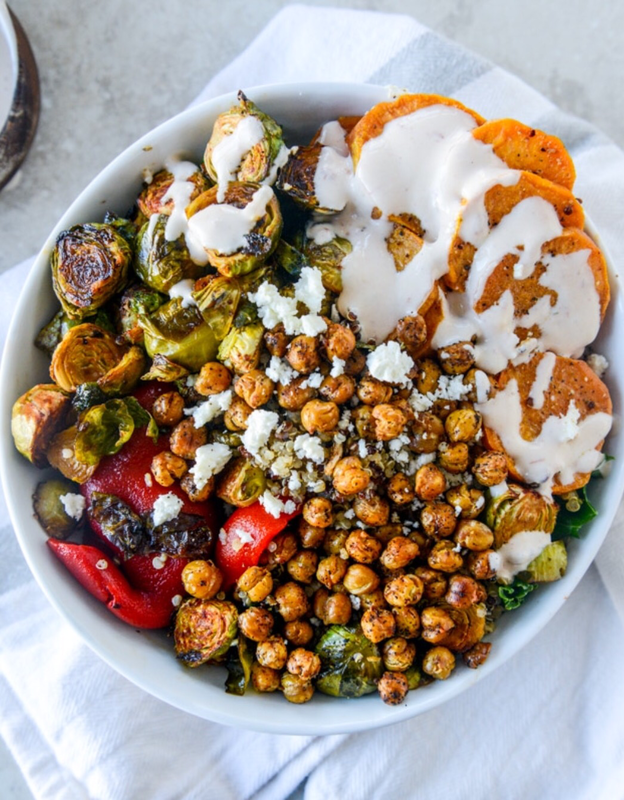 Even though I don’t have any little mouths to feed at home, I love veggie grain bowls. No matter how tired or in pain I am, I can always manage to whip up some variation of this simple, healthy stuff (which makes great next-day leftovers too). 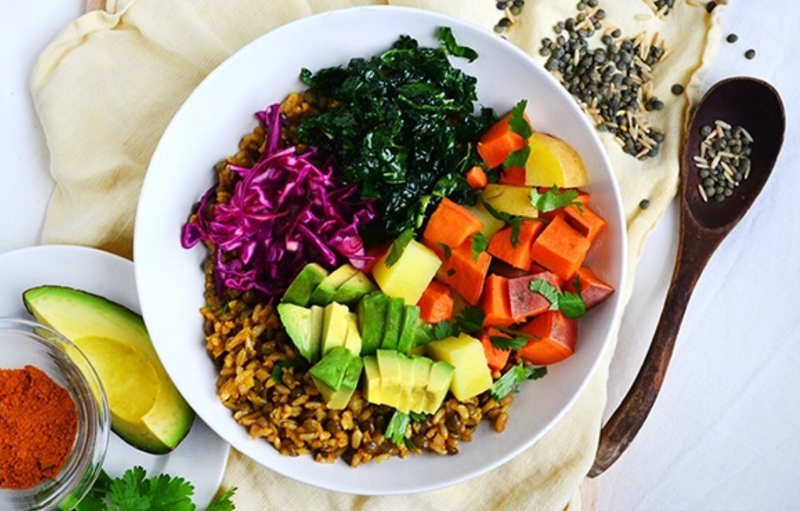 Here are five keys to building the perfect grain bowl. 1. 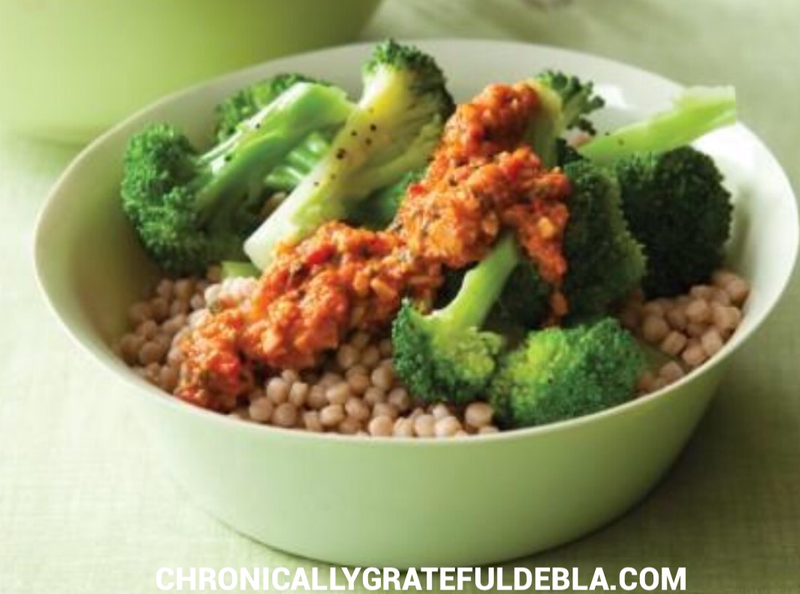 Grains: I like hearty ones like brown rice, quinoa, and whole-wheat pearl couscous (the plump kind). Cook a big batch on Sunday, and save 1/2 to 1 cup for each later-in-the-week bowl. 2. Veggies: The sweeter, the better. Think beets, sweet potatoes, butternut squash, and red bell peppers, onions, —leftovers come in handy here. Chop into bite-size pieces, and sprinkle over the grains. 4. Proteins: Add a handful of black beans, chickpeas, or edamame for a tasty protein boost (8 grams per 1/2-cup serving!). If you’re not into beans, go the baked cubed tofu or tempeh route. 5. Sauce: Use any bottled or homemade sauce you like—just make sure it is wow-worthy. Peanut sauce? Pesto? Annie’s Goddess Dressing? All game. That’s it! Garnish with any extra favorites like crumbled feta, fresh cilantro, sliced scallions, pumpkin seeds, or avocado, and dig in. I saw these recipes in a magazine and tweeted them to how my husband and I would like them. 1. To make Sauce: Heat oil in saucepan over medium-high heat. Add tomato paste, and sauté 30 seconds. Add onion and salt, and sauté 10 minutes. Add red peppers, garlic, and paprika; cook 5 minutes. Transfer to food processor, and purée with parsley, almonds, and vinegar. 2. To make Couscous and Broccoli: cook couscous according to package directions. 3. Steam broccoli 5 minutes, or until tender. Toss with oil and lemon juice in bowl. Divide couscous among bowls. Top with broccoli, then 3 Tbs. Sauce. 15 minutes, or until tender. Season with salt, if desired. 3. To make Chimichurri: Warm oil in small saucepan over medium heat. Blend parsley, lemon juice, garlic, paprika, and red pepper flakes in food processor until coarsely chopped. Pour in warm oil, and pulse quickly until blended. 4. 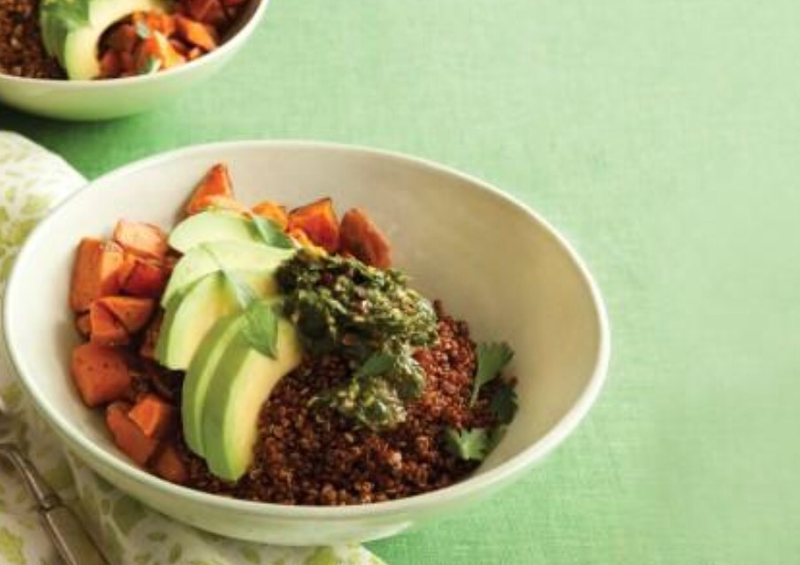 Divide sweet potatoes and quinoa among 4 bowls. Top each serving with 3 Tbs. Chimichurri, and garnish with sliced avocado, if using. Drizzle with extra Chimichurri, if desired. 1. Add your desired base to salad bowl. 2. Pour in desired grains. 5. Top with desired salad dressing. Choosefrom pesto vinaigrette, romesco vinaigrette, or spicy yogurt and lime dressing.